As of today, we have transitioned the Interfolio-provided support resources for the Faculty180 module away from the previous Knowledge Base (which was managed through a system called Freshdesk) and into the in-house Interfolio Help Center. As part of this transition, the process by which an institutional administrator should seek support from Interfolio has shifted into a new Support Ticket form located in the Interfolio Help Center. (They can also create a ticket simply by emailing help@interfolio.com). Both of these methods will provide a ticket number in a reply email to give you a reference for your ticket. We know that many institutions maintain their own technical documentation specifically for using Interfolio Faculty180 on their campus. In addition, Interfolio as a vendor maintains standard help content for the platform, the same for all client institutions. If you currently use an on-campus support process for Faculty180 that involves contacting an administrator at your institution, or if your institution maintains its own documentation for using Faculty180, please continue to seek technical support in the same way you always have. Any links to Freshdesk articles or resources now have a comparable link in the new helpsite. Article names have been maintained during the transition to allow you to easily find resources. Please submit a ticket if you have any questions or need help finding a particular resource. For those Faculty180 institutional administrators who communicate between their institution and Interfolio about technical support needs and product feedback, please see Submit a Support Ticket for instructions on the methods now available for getting support. Again: for most faculty and other administrative users, there may be no change to the process. To find out whether there is any change to support or documentation for you, please contact the person at your institution who serves as your designated Faculty180 administrator. After a user submits a ticket to the help-form or the help@interfolio.com email address, they will receive a reference number at the bottom of the email that is provided to assist in reviewing and documenting issues, feature requests, or other communications. 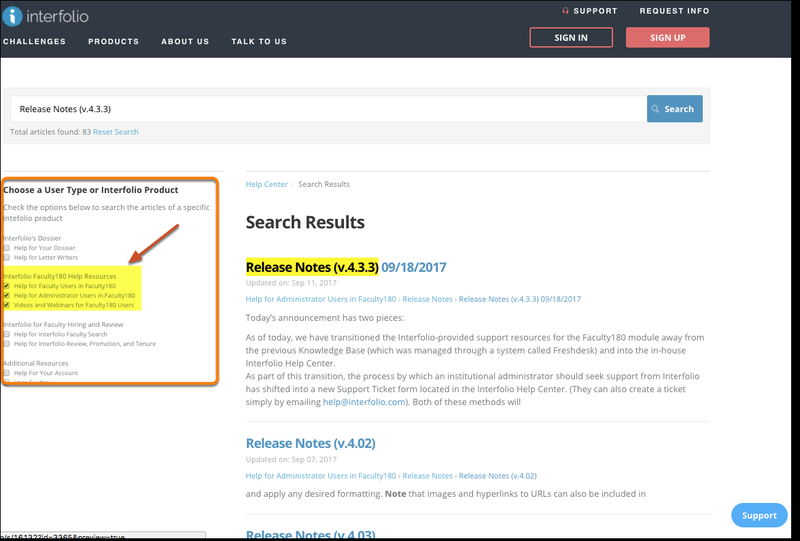 After navigating to product-help.interfolio.com you can perform a search for a relevant article in the search bar. 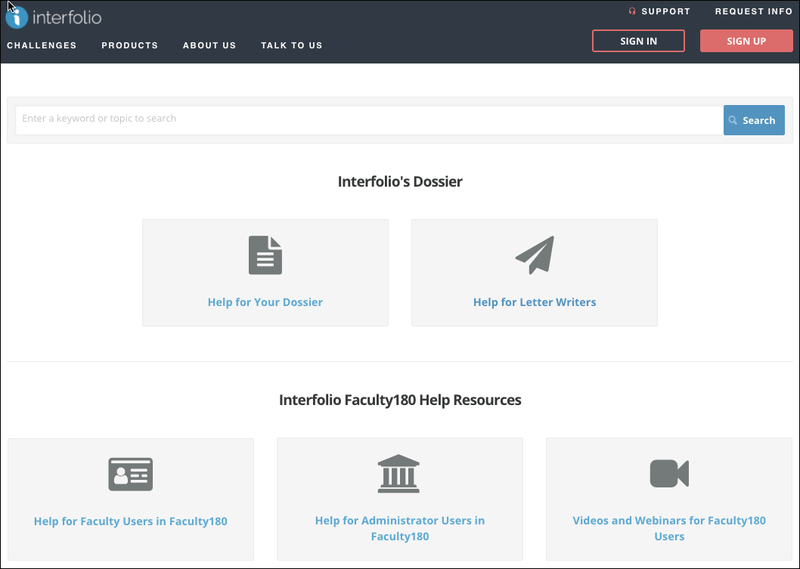 After using the Interfolio Help Center’s search function, please always use the filter on the left to search only the Faculty180 manuals. Where is this change coming from? Why do this? As the Interfolio faculty technology suite grows more unified throughout the next year, we foresee a growing number of institutions using more than one Interfolio module to manage different aspects of faculty work, data, and decisions. If we didn’t do this now, it could really be messy a year from now. So with this Help Center consolidation, we’re laying the groundwork for a smoother service experience for our client institutions in the long run—especially those institutions that use Interfolio not only for faculty activity reporting but also for faculty hiring, complex workflows, and career development.